Today is the 20 year anniversary of several important events. For starters, I had managed to last seven years in the corporate world, so on Friday, August 30, 1991, I was starting my first sabbatical: ten weeks paid time off. The tech industry was booming then, and they did things like that. I was also finishing up a masters’s thesis for a degree in psych I’d been working on in my spare time – I did things like that. But the most important thing we did on this day 20 years ago was bring home a dog. 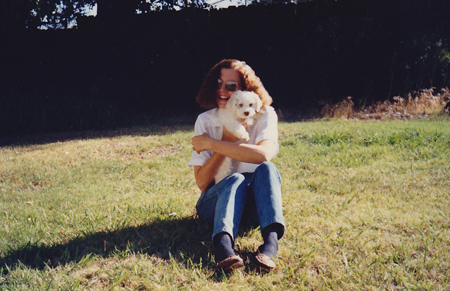 We had her picked out and all the arrangements made ahead of time, but that day – leaving work for ten weeks and bringing home a puppy to celebrate was one of the most memorable of my life. It was just a bit less memorable for Mary. Charis was riding in a crate in the back seat, howling because she wasn’t used to cars, so Mary thought she might be happier riding on her lap, where the puppy promptly peed. We laughed about it then and now – nothing a little soap and water couldn’t fix. We have shared every day for the last twenty years with one, or two, and recently three dogs (which is really too many but at the time we couldn’t say no). We started this anniversary day with a walk in the park for our two rescue dogs, and then another class. We’ve discovered that rescue dogs are analogous to foster kids – they have issues. These two are doing pretty well with extra training (which I sometimes call, reform school, depending on their behavior). A side benefit of the class is, it tires them out. As I write this, they are sleeping like little angels. A few years after we got Charis, I spent some time as a volunteer for the Folsom City Zoo Sanctuary. Vixen the fox had come there when she was four weeks old, so she got very used to humans. So used to humans that she could milk it really well, and as a result, she was getting rather pudgy. For her own health, some of the keepers and volunteers would leash her up and take her for walks. “Long story,” I said. And kept on smiling. Through all of it, all of the ups and downs, the joys and the losses, that’s what it’s like when you share your life with dogs and their wild kin. We have no pets now, but have had many dogs through the years. My favorites were two shih tzus named Max and Buster. Sweet little dogs need tough names. 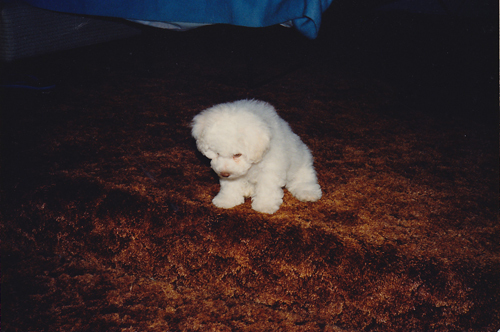 I also loved a mutt we named Lo Siento (Siento for short) because she always looked sooooo sorry after making a mess on the rug. She was a sweet one. Our last dog came to us the day my father died. He was a Jack Russel named Duffy (short for MacDuff). He was loyal, smart, and a little goofy. He would tuck himself in my husband’s chair and lay his head on his chest, hoping for constant petting. He really belonged to Dave. Most of the time I’m grateful we can pick up and run off at a moment’s notice without the responsibility of a pet, but only once in a while do I wish we had a dog again. They are great companions. It’s probably good that I don’t do dog posts very often. That first photo of Charis as she contemplates the depths of that first step, wondering how on earth she’ll ever make it — it’s just too cute! Better not get me started – I have an entire directory of cute dog photos, plus a box of pictures I haven’t yet digitized! Canine love is the best. I got my Maggie exactly one month after the death of my son, five years ago. She has kept me in love and out of loneliness! One October, at a Blessing of the Animals, I met an elderly man who had a little papillon (same breed as our youngest rescue dog). He said the dog had kept him going after the death of his wife. I also have a friend who turned his life around from a disastrous course with a lot of help from a stray he adopted. I never doubt the power of the bond we can form with our pets, especially dogs. Thanks for your comment. 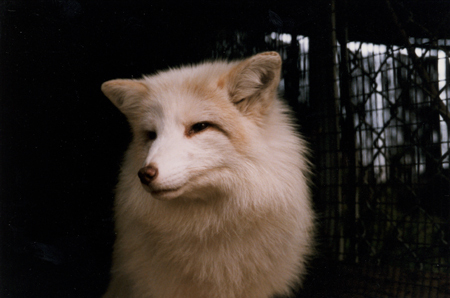 Sweet story — I had a Spitz who looked very much like your fox. Thought he was the best dog ever, until I got my Sheltie! Funny how they worm their way into our hearts, and we’re never the same thereafter! Wonderful picture. Thanks for stopping by and leaving a comment.